I’ve added a new category of this blog, Recipe Sessions. What I will do is Photo blog my attempts at some of my favorite recipes so you can follow along, step by step and make the same at home. Bookmark this category and check back once and a while for new recipes, or just follow my blog or my tweets and you will get the updates. My first recipe session will be Poached Pear Salad. The best part about this salad is that with a few simple tweaks to some mixed greens you have an amazing salad that will have your guests talking about what a great cook you are and leaving them tempted for the next course. 2. 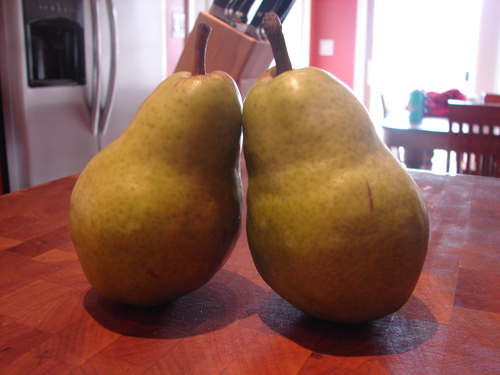 Get a couple 0f real ripe pears from the store / farmers market. 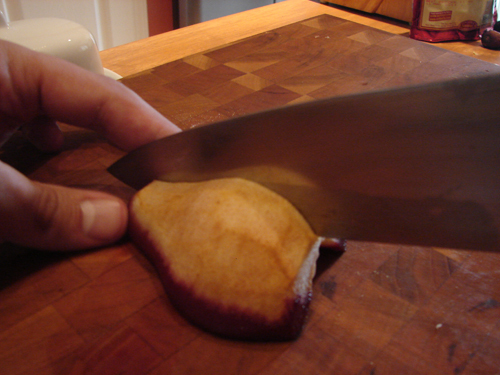 Pears are one of the easiest fruits to peel. 4. 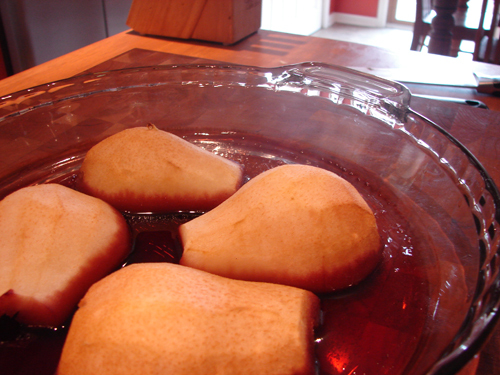 Peel the pears and leave them like above. 5. 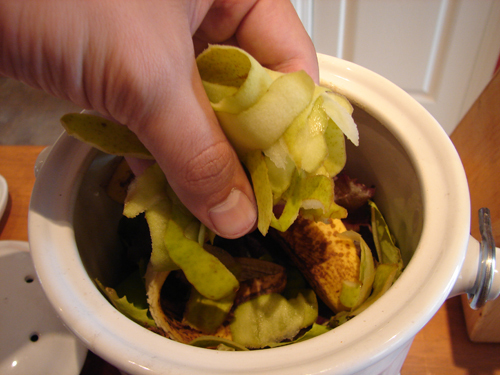 Of course, compost the scraps. 6. 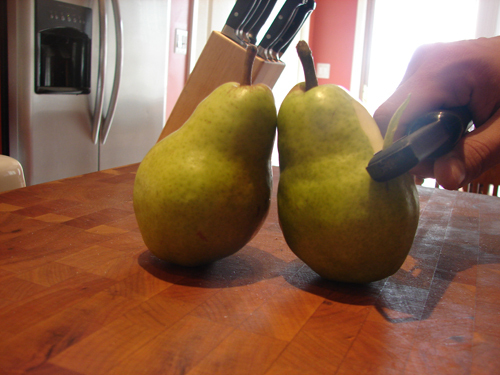 Cut each pear in half. 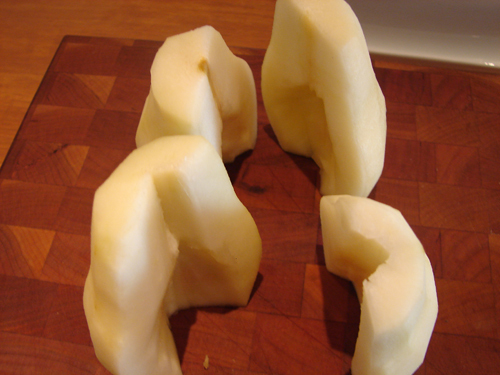 Core out the centers of the pear. 7. 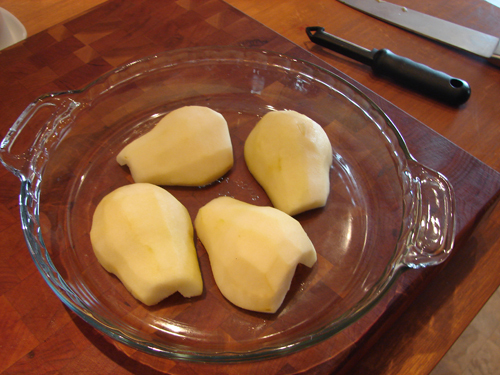 Place cut side down in a shallow dish. I used a clear pie pan, but any dish would work. I would recommend a clear dish though. 8. Put in the 1/2 Cup of Red Wine. I would recommend pouring off the the side for a better visual appeal. 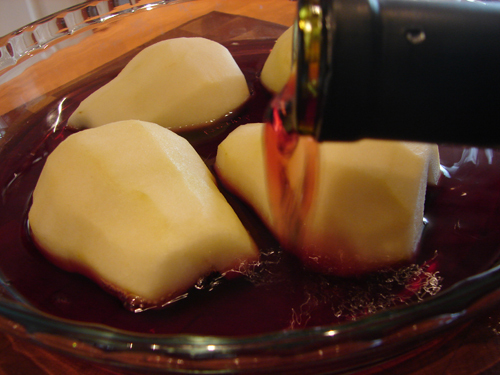 The red wine should go about 1/3 of the way up the pear. Now... Let's hit the sauna. 9. 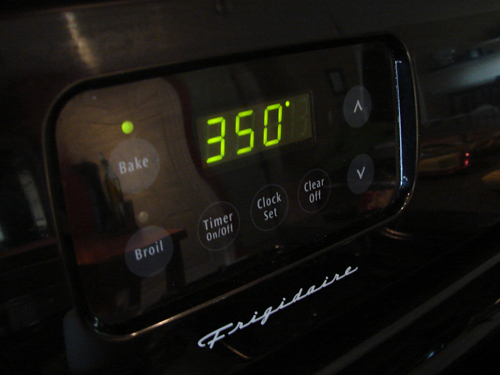 Put in the 350° pre-heated oven. Set a timer for about 45 minutes. 10. While the pears are bathing in the oven, grab a 1/2 cup of walnuts. Honey can you help me? 12. Combine. Kind of self explanatory, but I had the picture there so there you go. 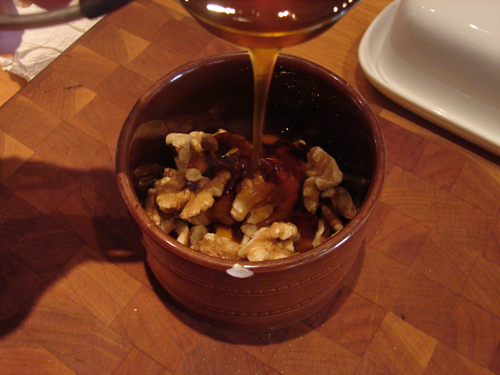 Mix well to ensure an even coat on the walnuts. 13. 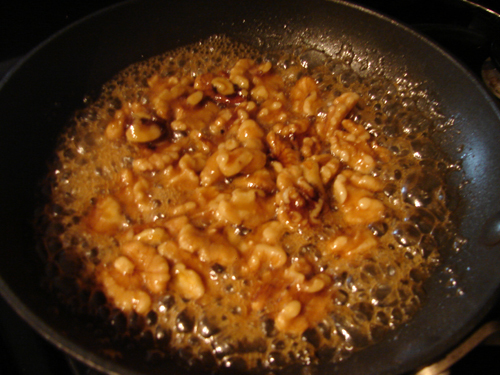 Now, let’s caramelize those walnuts. Throw them in a small skillet and fire it up. Heat on high. After about a minute or so the honey will start to bubble. 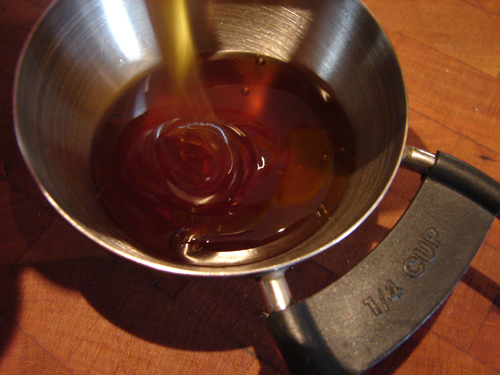 After another minute or so the honey will begin to look like caramel a little. It will darken in color and look less opaque. 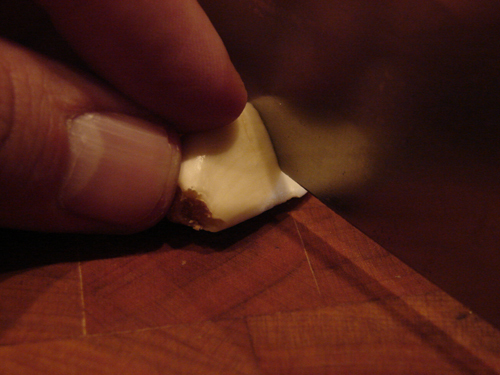 At this point, pour on to a baking sheet off to the side with parchment paper. 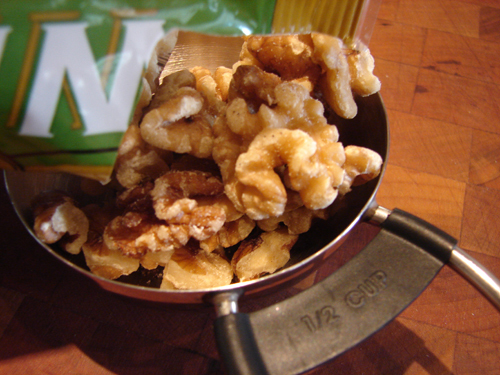 Separate the Walnuts and allow them to cool. 14. 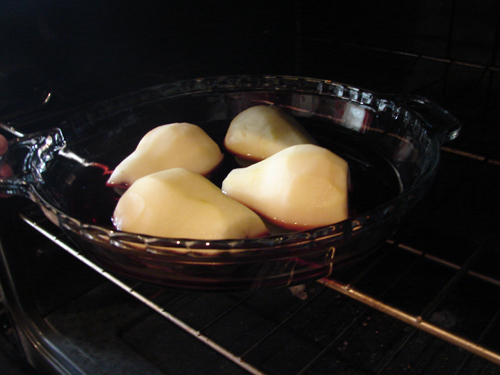 By this time your fingers are probably scorching from the honey… the timer will beep and your pears should be done. Check to make sure they are tender. Throw these in the refrigerator for at least 20 minutes to allow to cool. 15. 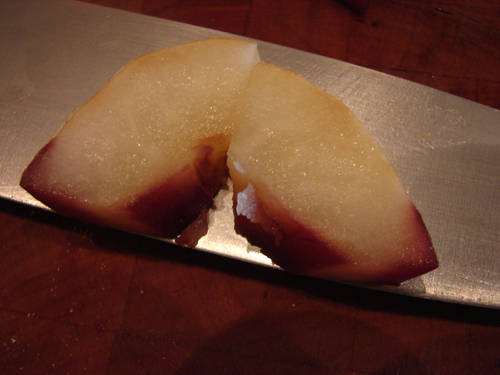 Once cooled cut the pears halves in half vertically as shown above. 16. Turn and cut horizontally in chunks about 1/4 to 1/2 inch thick. 17. 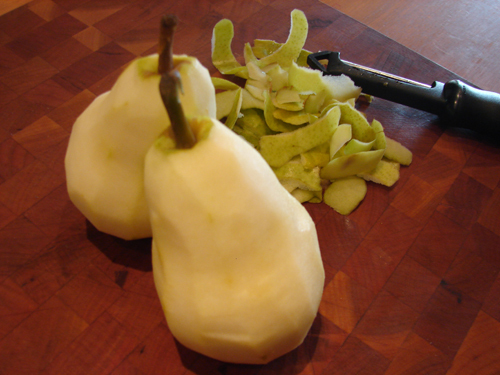 The pear chunks will look like this. I could have even let these go longer so the wine gets soaked up some more but these will still be good. Set these aside or back in the refrigerator. What did the Balsamic Vinegar say... "No pictures, I'm Dressing!" 18. Now it’s time for the dressing. 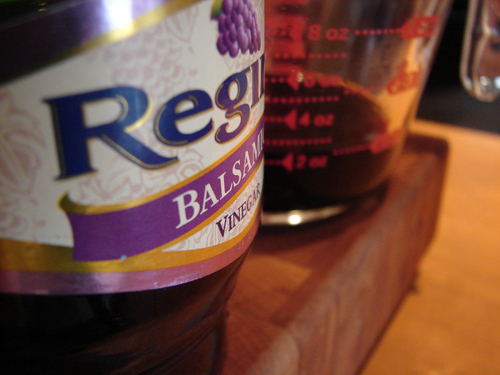 Start with 1/4 cup balsamic vinegar. 19. 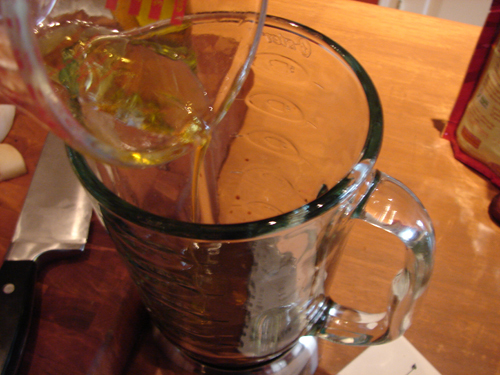 Throw in 1/2 cup of extra virgin olive oil. Now... one for my homies. 20. 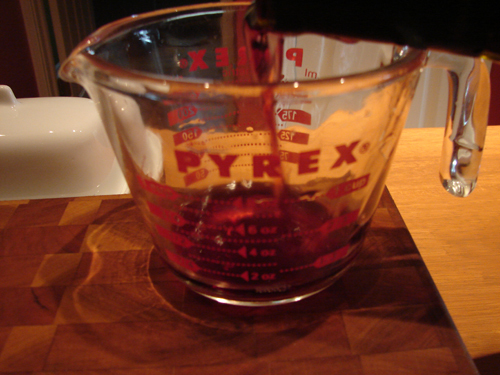 Add 1/2 cup of red wine. Now what to do with a half empty bottle of wine…. 21. 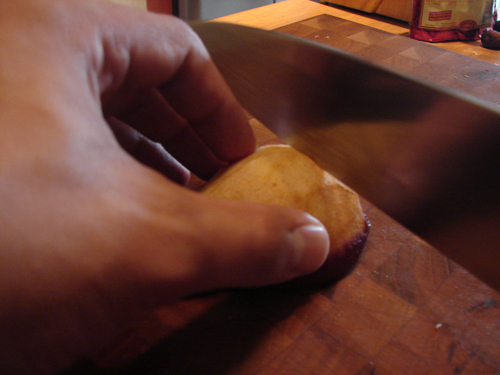 Chop up a garlic clove. You can rough chop, you will blend it anyway. 22. 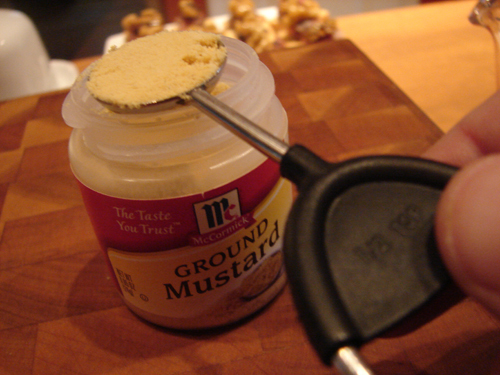 Throw in 1/2 teaspoon of ground mustard and put all ingredients in a blender or food processor. 23. Last step on the dressing. 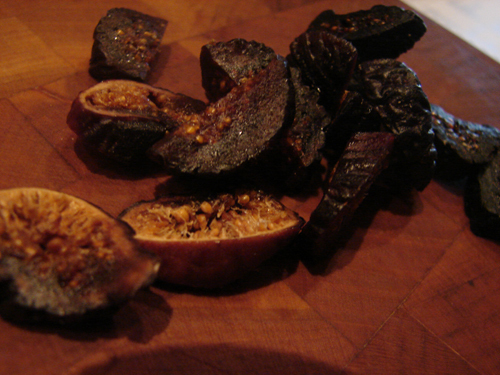 Chop up 3 or 4 dried figs, making sure to cut off the tips. Blend all the dressing ingredients for about thirty seconds to one minute until the figs and garlic are processed thoroughly. 24. Now that the dressing is prepared. Let’s compose the salad. 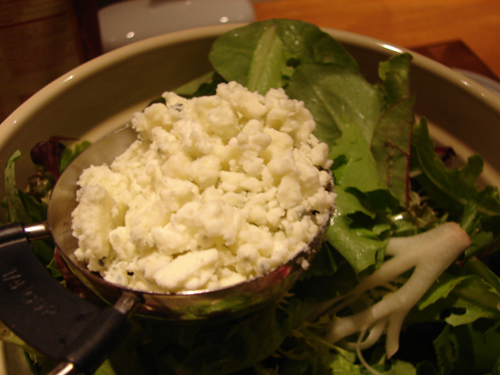 Top off the greens with 1/4 cup crumbled blue cheese. 25. 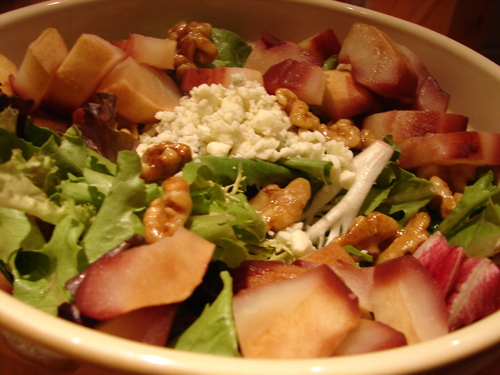 Throw on the candied walnuts and poached pears and toss. Drizzle with the fig dressing or leave to the side. That’s it. This would be a greater started salad to a nice entrée like pork tenderloin. Well that was fun, my first recipe session. Subscribe to my feed or follow my tweets to see more of these down the road.